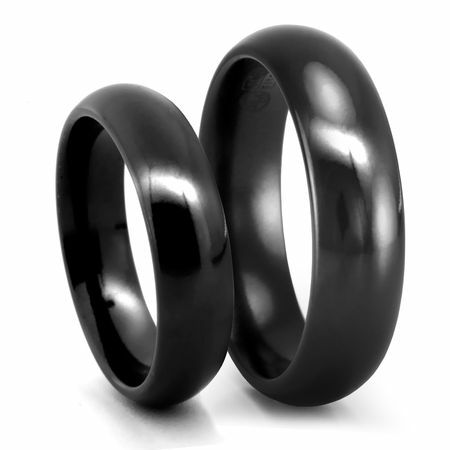 The classic domed and comfort fit wedding band, but in black titanium! Manufactured by Edward Mirell, the patent holder on black ti titanium, this is the real deal - not one of the black black plated knockoffs sold online and made in China. These rings measure 6mm wide and have a comfort profile on the inside. These wedding bands are beautiful! Got them today and I'd love to use mine right now, but, need to get married first (soon ;)). We got these rings as our wedding bands and I love them![...] I'm not sure if the rings run slightly large or if our fingers were off when we measured them, because they both seem a little big, but I'm going to give it a couple of days to see if they are too big. If they are, we will try to exchange them[...]. We purchased this set to be our wedding bands. We wanted our rings to be unique and not of the everyday. As soon as we saw them online we knew we had found "our rings". We are getting married in July and can't wait to wear these rings for the rest of our lives. Matching wedding bands for active lifestyles.